Failure to respond immediately and quickly after a fire or water damage, can contribute to unnecessary secondary damage. This can even lead to aesthetic problems like discoloration or even serious problems like structural damage to the entire property. In order to keep repair costs low and manageable, a timely response is necessary after the fire has been extinguished or after the flood has been contained. 1.1 Is cleaning necessary after a small fire? 1.2 Can I clean the smoke and fire damage myself? 1.3 How is my property going to be restored after a fire? 1.4 Are smoke odors in my home harmful? 2.1 My property is entirely flooded with water, what should I do? 2.2 How long will my property take to dry? 2.3 How can I determine that my property is fully dry? 2.4 How much does the water remediation service cost? Is cleaning necessary after a small fire? Whenever you have a fire on your property, the resulting damage is usually odor and smoke (soot). The odor is usually produced because of presence of smoke in the air. Soot particles tend to be quite small and only get visible once they fill up the air. Smoke spreads fast, which makes it very hard to contain within one room in the property. This means that regardless of how big the fire is, fire remediation services are necessary, in odor to clean the odor that causes the residue. Can I clean the smoke and fire damage myself? Well, it all depends on the situation. Many property managers and homeowners have tried to do it themselves. However, they have encountered various issues. 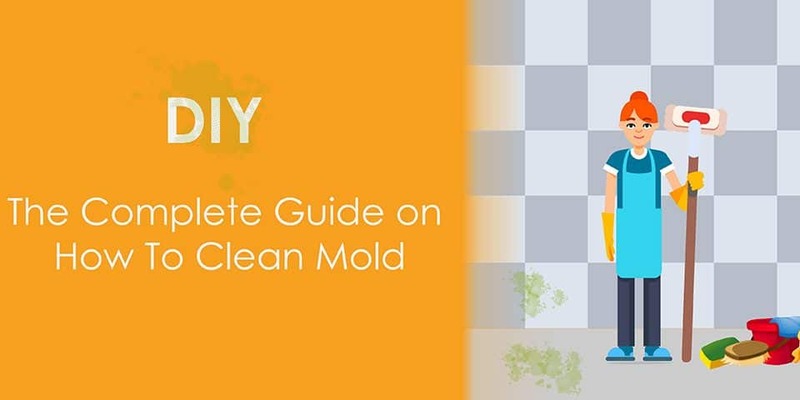 For example, when residues mix, then it will be hard to clean up the damage on your own, without enlisting the services of professional fire remediation experts. Fire and smoke might mix with water, forming a destructive ash residue. The average homeowner or property manager might not have the skills, tools and understanding to carry out such an extensive cleanup process. Some homeowners have also cleaned the visible residue, but the home still smells smoke. This is where professionals come in with the right tools and materials, to clean up your property. How is my property going to be restored after a fire? The truth is, fire damage restoration requires highly specialized tools and equipment. The methods applied for situation differ. All you have to do is to call in restoration experts once your property has been damaged by fire, so that the restoration process begins immediately. Are smoke odors in my home harmful? Your health care provider is the ideal person, to determine whether soot or odor damage, poses any health risks. However, you need to know that various harmful toxins are released into the air, when a fire occurs. It is therefore important to ensure that your home is thoroughly cleaned and there are no lingering odors. My property is entirely flooded with water, what should I do? First, you need to stop the water source that is causing the flooding. If you find that you can’t do it safely, then you need to consult a professional such as plumber or water restoration experts. 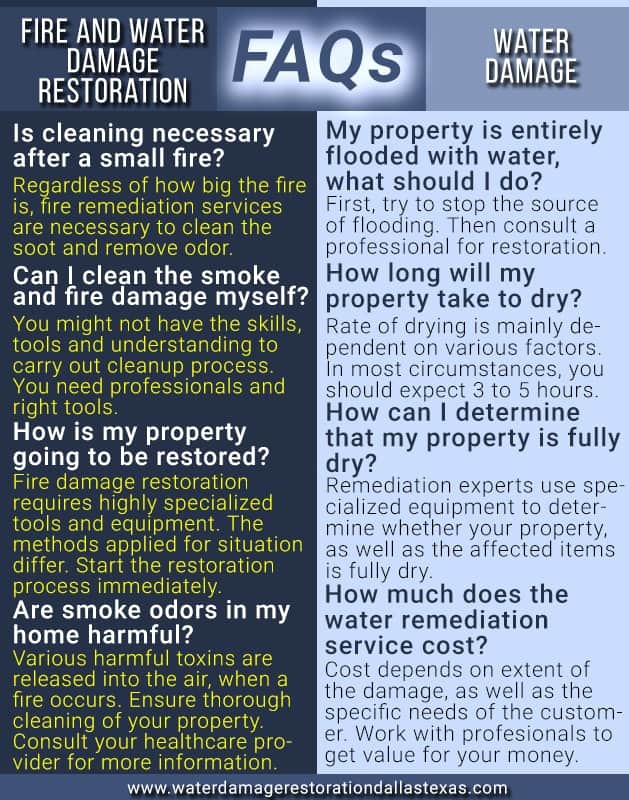 Fire damage and water restoration in Dallas Texas experts will be at your venue in less than two hours, ready to clear all the standing water and commence the drying process. This process will ensure that most of your water-damaged assets are addressed and restored. The rate of drying is mainly dependent on various factors. These include the location of your property, types of building materials, size of the flooded area, weather conditions, as well as the time taken for the remediation work to commence. What you need to know is that each situation tends to be unique. However, in most circumstances, you should expect your property to dry within 3 to 5 hours. How can I determine that my property is fully dry? Remediation experts always use specialized equipment, in order to determine whether your property, as well as the affected items is fully dry. These equipment usually test the amount of humidity or moisture in the air, versus normal moisture conditions. How much does the water remediation service cost? Every restoration project is different and unique in its own ways. This means that a project can only be individually priced based on the extend of the damage, as well as the specific needs of the customer. Therefore, there is no standardized rate or fee. You will only be charged for the work done, and nothing beyond the services delivered. However, it is advisable to work with reputable Fire damage restoration in Dallas Texas experts, in order to get value for money.